Last week, Jair Bolsonaro was stabbed at a campaign rally. He’s running for president of Brazil. Many call him “the Brazilan Trump.” He’s known for his racist, sexist and homophobic comments. But he might follow Trump’s success. After he recovers from surgery, he’s expected to win the election. That would put him in charge of South America’s biggest economy. Brazil has been suffering a recession for years. Government scandals and corruption are as common as sunscreen on a Rio de Janeiro beach. Brazil’s stock market has also burned investors for a decade. If you had invested $10,000 in the iShares MSCI Brazil ETF ten years ago, it would be worth about $5,000 today. Argentina is South America’s second largest economy. And it looks even worse. Argentines are struggling (again) with run-away inflation. According to Trading Economics, inflation for the 12 months ending July 2018 soared more than 30 percent. It’s just one more reason to sell emerging market shares. At least, that’s what many people think. The iShares Emerging Market ETF (EEM) dropped about 11 percent during the first eight months of 2018. In contrast, the S&P 500 gained about 9 percent. But investors shouldn’t dump emerging market stocks. Baron Rothschild is credited with an age-old maxim. He was an 18th century British nobleman and member of the Rothschild banking family. He reportedly said, "Buy when there's blood in the streets, even if the blood is your own." One decade’s winner is often the next decade’s loser. In fact, sometimes investors should fear rosy outlooks. Economic carnage is often better. Here’s an example. By the year 2000, U.S. stocks had been roaring for years. Between January 1982 and December 31, 2000, they averaged a compound annual return of 15.48 percent per year. That would have turned a $10,000 investment into $154,144. Growth accelerated over the five-year period ending December 31, 2000. U.S. stocks averaged a compound annual return of about 19 percent per year. It reminded me of a song by Timbuk3: “The Future’s So Bright, I Gotta Wear Shades.” The U.S. wasn’t fighting a high profile war overseas. Unemployment was near an all-time low. The government didn’t suffer from a budget deficit. They actually had a surplus. Many investors, much like today, snubbed emerging markets. They wanted to stockpile U.S. stocks instead. But their reluctance hit them in the wallet. 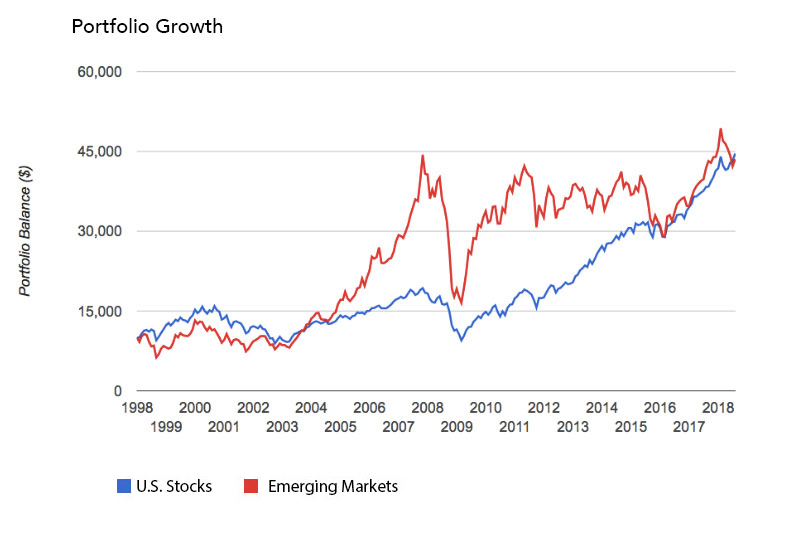 Over the next ten years, U.S. stocks lost money while emerging markets soared. A $10,000 investment in U.S. stocks dropped to $9,733. 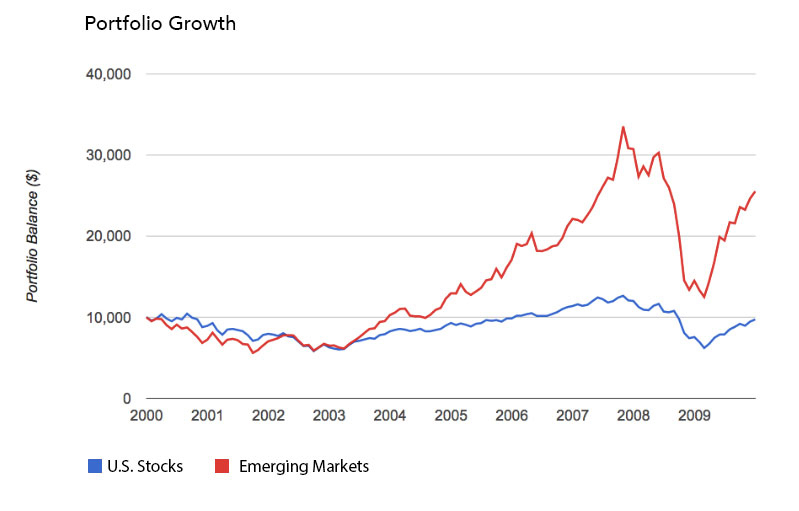 The same investment in emerging market stocks grew to $25,520. It would be crazy to think that couldn’t happen again. Emerging market businesses continue to earn record-breaking profits. Their stocks just aren’t responding. Discrepancies between high business earnings and low stock returns never last forever. Eventually, investors catch on. According to Star Capital, emerging market stocks had a CAPE ratio of 16.4 times earnings, as of July 31, 2018. That means they’re cheap. U.S. stocks, in contrast, are priced at twice that level. Let me explain this with a story about two stores. Imagine that they’re both up for sale. Each store generates $100,000 in net profits every year. But the owner of the first store is selling it for $1.6 million. The owner of the second store wants $3.2 million. The first store is also located in a fast-growing neighborhood. The second store isn’t. Smart investors will rush to buy the cheaper store. It has higher growth potential and it’s half the price. The second store (the expensive one in a low-growth market) represents U.S. stocks. The first store represents emerging market shares. I’m not saying you should sell everything to gamble on an emerging market bull. Instead, maintain a diversified portfolio that includes an emerging market index. Rebalance once a year, to maintain a constant allocation. Target retirement funds and disciplined investment firms will rebalance for you. If you’re adding money every month, such firms will direct that money to the lagging asset class–even if it’s bleeding. By doing so, they might reduce risk and boost returns. For example, over the past 20 years, U.S. stocks gained a compound return of 7.53 percent per year. 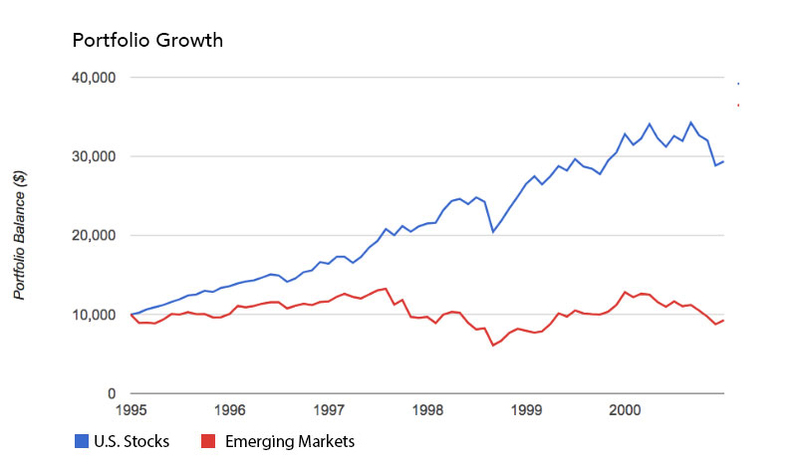 Over the same time period, emerging markets averaged a compound return of 7.41 percent per year. But having 90 percent in U.S. stocks and 10 percent in emerging markets would have beaten both–if such indexes were rebalanced once a year. Over the 20-year period, this portfolio would have averaged 7.73 percent. Plenty of DIY investors don’t have the courage to rebalance. They’re afraid to sell proceeds from a winning stock index. They fear adding money to a lagging market index. That’s a pity. Long-term, it’s best to diversify and keep a constant allocation. When there’s blood in the streets, it doesn’t pay to run.